In the post-9/11 era, Muslim women donning a headscarf in the United States find themselves trapped at the intersection of bias against Islam, the racialized Muslim, and women. In contrast to their male counterparts, they often face unique forms of discrimination not adequately addressed by Muslim civil rights advocacy organizations, women’s rights organizations, or civil liberties advocates. From the outset, it is worth emphasizing that there is no singular, unitary “Muslim woman” that can represent the experiences and grievances of the diversity of women who identify as Muslim. These women come from various racial and ethnic backgrounds, hold diverse political viewpoints, and adopt beliefs ranging from staunch secularism to religious orthodoxy. That said, their Muslim identities often subject them to common adverse experiences because they are falsely stereotyped as meek, powerless, oppressed, or, after 9/11, as sympathetic to terrorism. Muslim women of all races and levels of religiosity face unique forms of discrimination at the intersection of religion, race, and gender because the September 11th terrorist attacks transformed the meaning of the Muslim headscarf. The debate no longer centers on whether the pejorative “veil” serves to oppress women by controlling their sexuality and, by extension, their personal freedoms and life choices, or if it symbolizes choice, freedom, and empowerment. Rather, it now “marks” them as representatives of the suspicious, inherently violent, and forever foreign “terrorist other” in our midst. Because most Americans view Islam as inherently foreign, most female Anglo converts to Islam are stereotyped as Arab particularly if they wear the headscarf. Examining the nuances of their experiences exposes the unique challenges they face as Muslims, as women, and as racial or ethnic minorities or those perceived as such. By analyzing the experiences of women who wear a headscarf, a religious gender marker, this policy paper brings gender to the forefront of the discussions on post-9/11 discrimination. Accordingly, it examines how 9/11 adversely impacted the lives of headscarved Muslim women in ways different than it did Muslim men. Ten years later, there is a plethora of literature about what has become known as “post-9/11 discrimination.” Most of the discussion focuses on the experiences of Muslim men or analyzes law and policy through a masculine paradigm. Amidst pervasive suspicion of Islam, continuing sexism, and bias against particular racial or ethnic groups, however, Muslim women are both visible targets and silent victims. Not only are their religious freedoms under attack in unique ways because the headscarf is unique to women, but they are objectified in ideological and corporal domestic conflicts that profoundly affect their life. 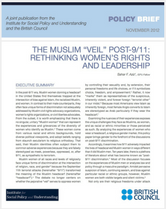 Perhaps worse than the gender rights debates of the 1990s, when Muslim women were talked about rather than talked to, their post-9/11 experiences are neglected by mainstream American feminist organizations or used by male leaders of Muslim organizations to implement a civil rights agenda tailored to the Muslim male experience. Consequently, Muslim women are caught in the crosshairs of national security conflicts that profoundly affect their lives and receive inadequate support from advocacy groups focused on defending Muslims, women’s rights, or civil liberties post-9/11. Beyond gender subjugation, a number of headscarved women also find their freedom of choice in religious practice restricted due to racial violence and insidious forms of economic discrimination. Furthermore, their safety is threatened as the attacks strike at their self-esteem, individual autonomy, and placement in the family and community power hierarchy. Additionally, physical threats strip them of their fundamental right to safety and religious expression. As a result, groups involved in Muslim rights, women’s rights, and civil liberties, must cast off simplistic views of discrimination that ignore this phenomenon at the intersection of gender, race, and religion. As Muslim women increasingly suffer attacks from those with entrenched anti-Muslim attitudes, the urgency of more holistic strategies becomes obvious. To combat multipronged discrimination, advocacy groups must address headscarved women’s unique intersectional needs. Towards that end, a diversity of Muslim women must be included in the leadership ranks of American women’s rights groups, civil liberties organizations, and Muslim civil rights organizations to develop a comprehensive anti-discrimination agenda.